Ted Grauer at podium, Eric Nost in background . An Iowa environmental organization is calling on Senators Tom Harkin and Chuck Grassley to back proposed changes to the Clean Energy Security Act, which passed the House in June. Eric Nost (rhymes with “lost”), with Environment Iowa, is asking Iowa’s U.S. Senators to support provisions that would include requiring utility companies to reduce their energy usage by 10% by providing incentives to help customers make their homes and businesses more energy efficient. Nost says a new national report shows the policy changes would provide a big boost to Iowa’s economy. “By passing these policies, our Senators, in just over 10 years, would give 6,200 Iowans jobs and save the average Iowa family $282 per year on their energy bills,” Nost said. The report was released by the American Council for an Energy-Efficient Economy. The organization claims the efficiency provisions would also reduce carbon dioxide emissions nationwide by 480 million metric tons by 2020. Ted Grauer, who owns an engineering design firm based in Van Meter, joined Nost at a press conference today in Des Moines. Grauer provided an example of how energy-efficiency incentives in the bill might help school districts in the state. His business is installing high efficiency lighting and a geo-thermal heating and cooling system in an elementary school in southeast Iowa. The changes will save the Central Lee School District about 33% on their annual energy bill. Grauer also explained how an expansion of the energy bill would create more jobs. “There are about 15 guys (at the elementary school) drilling 200 feet deep wells for the geo-thermal. That’s a bunch of labor coming from the labor pool in Iowa. 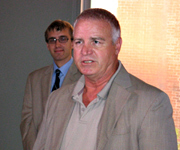 So, the more efficiency programs that would go into place, more people will be putting those projects in,” Grauer said. “We have the technology, but it takes manpower to install the technology.” According to the report, the legislation passed by the House would create 4,300 new jobs in Iowa and save the average household $211 per year.